Oh what fun I have had recovering our home PC. I wrote a few days ago how I managed to create a XP install CD which didn't require me to supply device drivers through a none existent floppy drive. What I didn't mention is that both trying to recover and install a new version of XP failed with an error message that lasted on the screen for about a nano second. So it was repeatedly failing but I couldn't see why! The problem was caused by a dodgy disk drive that had errors and the fact that XP didn't just give up and die is a tribute to it's design. But it is a real bugger that it displays the error for such a short period and that it isn't written into any of the log files. Fortunately, in the past I spent many years working in IT Support, so have learned that often whining about a problem is just wasting your time and it is more productive to figure out a work around. 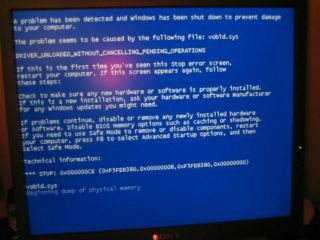 The answer in this case was to spot the pattern of when the error occurred (when the installer said it was installing devices and there was 34 minutes left) and in the nano second that the Blue Screen error was displayed - take a photo of it. It took me a couple of goes because of the delay in digital cameras and I also had to disable the flash (not by going through the setup - I just put my finger over it). But that gave me the image you see here. 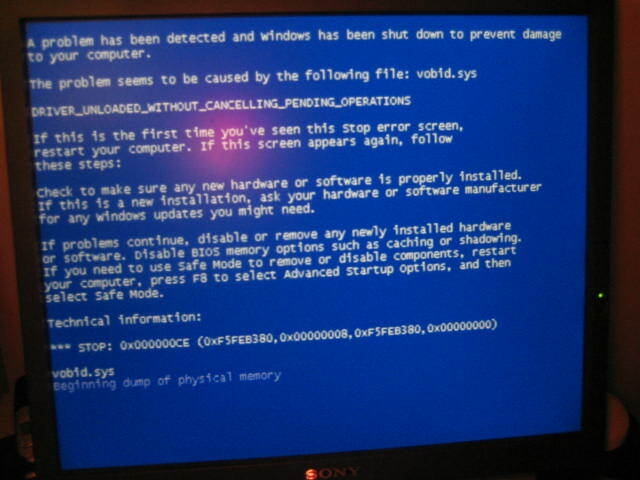 Once I discovered that it was complaining about vobid.sys I was motoring. A good search of t'internet showed that this was the driver for the virtual CD in Pinnacle Instant CD. This was a software package that came with the PC that I have never used (I use Ahead Nero for CD/DVD burning). Booting the PC into DOS from a CD and running NTFS from Winternals allowed me to delete all of Pinnacle and low and behold the XP Upgrade worked and I was back in business. For some reason Picassa decided to store the image on localhost rather than blogger so it all looked fine to me but obviously not for anyone else. Fixed now. Ha ha. Very good Ben. Unfortunately I don't have a video camera and the resolution of film clips from my IXUS 40 stills camera in video mode would not be sufficent to read. Have you got a floppy?